My fitness journey started back in 1997-8 when I came across some Bruce Lee books on the internet. The first book I ordered and then read of his was a book called ‘The Art of Expressing the Human Body’. I then purchased all of his films and books and really fell into his whole philosophy on life. Although I strangely never really wanted to learn martial arts, it was more the body-weight exercises, weight-lifting and general philosophy of Bruce Lee’s that I was attracted to, something about him as a person attracted me to his writings. Since then I regularly go back to his books for inspiration on various different aspects of life, Striking Thoughts is one of the books I used to pick up randomly to get a new thought process going. Anyway, I started doing bodyweight exercises like push ups (I managed to build up to two finger push ups, on two hands, not one though!) and various other bodyweight exercises, and then a few months later I met my partner Dena. A few years went by and hadn’t really moved on from doing the basic bodyweight exercises and had in fact got pretty stagnant and lost interest in keeping fit really. But then a guy at a place I worked mentioned a fitness challenge that had come over from America called “Body for Life”. I was instantly hooked, I went online to read more about it, then I ordered the book. It required you to lift weights and eat healthy for 3 months, take a before and after photo and then send them in along with a brief article about why you wanted to get fit etc to the people behind it over in America. Yup, that’s little old me, all 9 stone 2lbs of me! 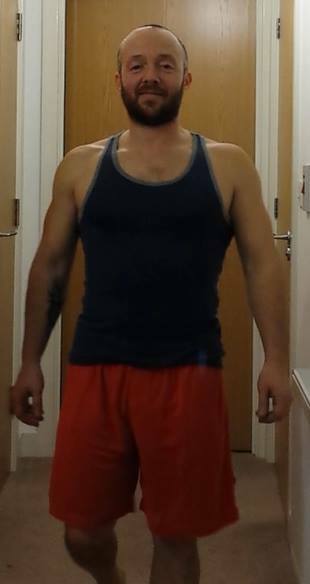 After 3 months had passed I hadn’t put on that much muscle really, I seem to remember being about 9 and a half stone, not because I didn’t lift many weights, nor because I wasn’t eating healthy, but at the time I didn’t know why and so I did another challenge straight after it. I was to find out during the 2nd 3 month challenge that it was due to not eating enough food. 16lbs of mainly muscle gain is pretty good I’d say! And for me that was it, I was hooked on health and fitness, specifically lifting weights, or so I thought. 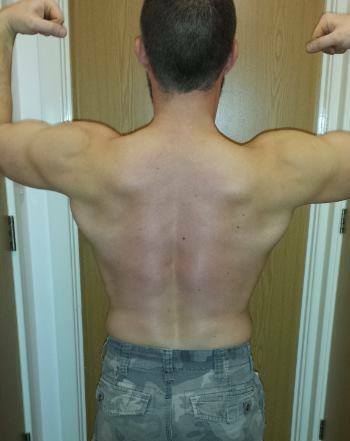 I kept this physique for about another year or so, and then I fell of the rails. Life got in the way and I got back into old habits. A few more years past, and my partner and I decided to go travelling for a year, mainly to reevaluate our lives, as we had both become stagnant in our day jobs and didn’t know what we wanted to do. After coming back from travelling for just over 14 months, we both realised that we loved working outdoors and that for our sanity and health, we should try to gain outdoor work as our main job. Fast forward to the beginning of 2009 and 4 years or so had whizzed past where I had started smoking, stopped smoking, started working out, stopped working out and started smoking again. But 2009 was a great year as we both obtained jobs working on a fruit farm, and this was the restart of my fitness journey as I re-read a lot of the Bruce Lee books I had, and got re-energised into working out again, at least with bodyweight exercises anyway. It took me another 2 years to really get going properly. I did a lot of bodyweight exercises during those two years though, mainly push ups, pull ups, one leg squats, handstand presses etc, but I also managed to stop smoking once and for all too! It wasn’t until the beginning of 2011 that I really decided to get back into weightlifting again, I woke up one morning and thought to myself, right sort yourself out, lets get on with this (or perhaps they were more rude words but similar in their effect!). And I bought myself a basic weights set and vowed to stick with it. I really knuckled down between spring 2011 and summer 2014, and I put on about 7kg in weight, which again was mainly muscle, along with some body fat. I think I was 71kg and 14% body fat in both those pictures above, which is the heaviest I’ve ever been. Note I didn’t say leanest, because I’ve never been leaner than I was back in 2001-2, and to be honest I’m not that fussed with seeing my abs, as I do like my chocolate, rum and fizzy pop! Anyhoo, in February 2015 I weighed 74kg, which is by far the heaviest I had ever been, but I was also the strongest I had ever been. 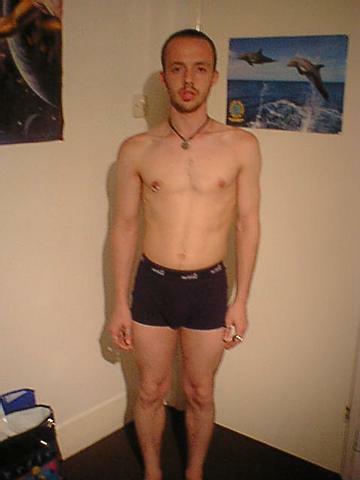 I don’t know what body fat I was, but I do know my waist was the biggest it had been at 34.5″. Then at the end of my 2nd 10 week routine at the end of May 2015, I decided that I had let my waist get big enough and it was now time to reduce it. Again, I wasn’t bothered about seeing abs, but I didn’t like the love handles I had grown. So I changed my weightlifting routine a little and nailed down my nutrition and went on a 6-8 weeks cut. Then towards the end of July 2015 I started Crossfit with what’s called a 1/2 Cindy routine and did 2 of those workouts a week whilst also lifting med/heavy weights on both days at the weekends. Crossfit didn’t last too long as I got bored of the bodyweight workouts quite quickly and as I’ve never really enjoyed the olympic lifts I never bothered trying to get into them and so I went back to my weight lifting routines 3-4 times a week. I then left the farm job due to financial reasons at the end of 2015, and this led to me moving back to my home town. During this time I stopped lifting weights and doing any decent exercise for about 4 months. Once I got settled back in a new job and new house in the city, I started lifting weights again and got my fitness and strength levels back to decent levels. After a year of a new job back in my home town, I realised that I needed to change things up again as the day job wasn’t allowing me the freedom to do the weight lifting I wanted to do, seeing as though it was a mix of a day and a night job. So I changed jobs at the beginning of 2017 once again and this time went into parcel delivery. Which I’m still in as of Jan 2019. Althougj I’ve changed the company I work for once again, I’m still delivering parcels, but I’m working less hours so I’ll have more time and energy to lift weights again. And so that’s my fitness journey so far. As you can see it’s been an on/off journey but I’ve always come back to some form of physical activity. I’ve always been interested in health and fitness over the years and I feel that I’ve gained a lot of knowledge from using myself as a guinea pig. My lifelong aim is simply to stay strong, fit and healthy for all aspects of my life and if there is one thing I’ve learnt over the last 20 years or so, it’s that being active is more important than just eating healthy. I’ve always eaten pretty well, but when I wasn’t active I had various different health and mental issues that I struggled to overcome, and it’s only since being more active have I been able to overcome those issues and as I’ve said before, right now I am fitter, stronger and healthier both physically and mentally than ever before, and I don’t think it is a coincidence that I am also my most active than ever before (e.g I have a very active day job and I exercise outside of it too). Not bad for someone who has gone past 40 I’d say!